Check off Michigan as another state where the gardeners are just as nice as you could imagine! They join Indiana, Ohio, Kentucky, Iowa, and Florida on the list of states I've spoken in where the gardeners have been the nicest people. Ha. No, I will not rank those states in order from nicest to really nicest to the absolute nicest. I am no fool! I was delighted to join Jessica Walliser of Savvy Gardening and Craig LeHoullier of Epic Tomatoes as one of the speakers. I had a great time. I got to share my favorite non-hoe gardening tools and then tell some secrets to happiness in your garden. Plus, I got to wear my T-shirt with all the gardening tools on it and have people admire it and covet it, and not point and ask, "Who's that eccentric gardening lady?" I got to buy some hand-made craft items, mostly pottery pieces made by local potters. I even bought some snowdrops dug up from an area at the University of Michigan-Dearborn Environmental Interpretive Center that they are working to restore to a more natural state, which doesn't include non-native snowdrops. So every year they dig up a few more and sell them. 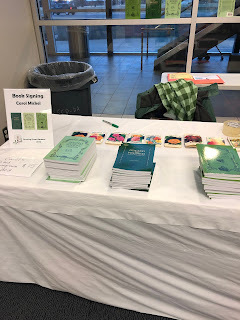 I got to sell some books. I got to be on the same stage as Jessica and Craig. And a dog that did nice tricks while dressed as a leprechaun of sorts. Have you ever had to be the one to speak right after a dog dressed in a leprechaun outfit? Well, if you haven't, let me just say that you have to breathe deep, stand tall, and bring your A game (or G game for us gardeners) and hope for the best! All good, but the best part is always, always meeting gardeners. Always the nicest people. Always. Now back home in Indiana, I am a day late in planting my peas. My sister, of course, planted her peas yesterday with the help of her two grandchildren (4 years, and 1+ years) and sent me a picture of them helping her sow the seeds. They were all wearing mittens. Now I'm scrambling to get caught up. Plus, I have to plant my pansies and violas! Want to buy one of my books? I will soon put the newest book up for sale in my online store. Thank you for your patience. See above. I've been busy and traveling a bit. 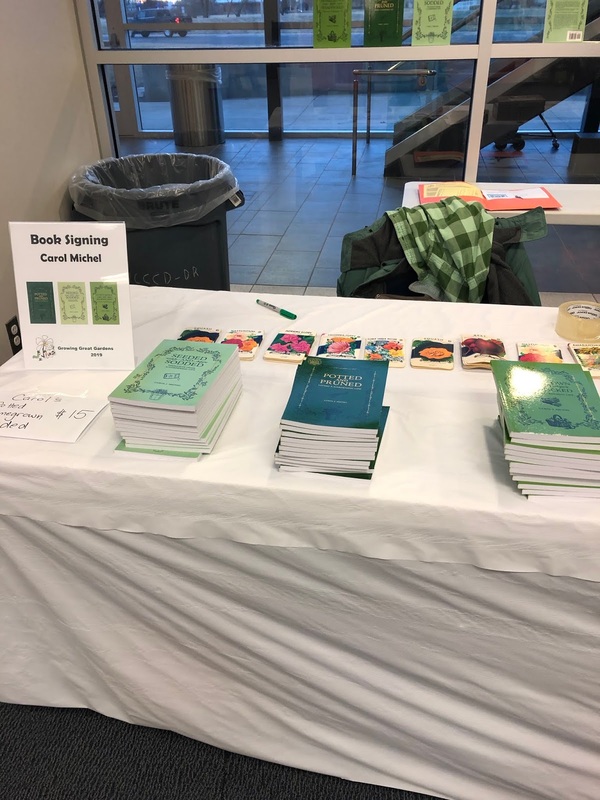 In the meantime, if you are local to me, I'll be at the Johnson County Public Library Local Author Fair on Saturday, March 23 with all my books, including The Christmas Cottontail. We'll be at the Clark Pleasant branch, 530 Tracy Rd., Ste 250, New Whiteland, Indiana from 10 am to 1 pm. Stop by and say hi and we can talk about gardening! If you can't come to the local author fair, you can ask your local independent bookstore to order my books for you. They are happy to do so. My favorite local independent bookstore is Wild Geese Bookshop in Franklin, Indiana.